Which British cyclist is tipped to become one of the world’s top-10 time-trialists? The endorsement is from time-trial expert Michael Hutchinson, speaking about the new female specialist taking the British scene by storm: 27-year-old Cambridge PhD student, Hayley Simmonds. 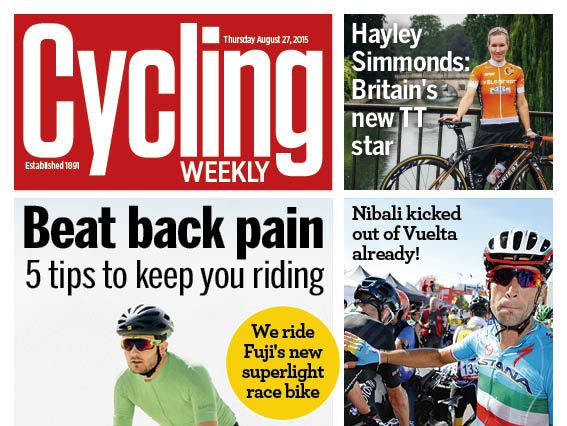 In this week’s Cycling Weekly we speak to the sensation to find out how she switched from competitive rowing to time-trialing, and lost a staggering 46 kilograms to make her the athlete she now is. She beat Dame Sarah Storey in the National TT Championships in June to make her the defending champion in the National Championships, the National 10, 25 and 100-mile races. But where does the future lay for Simmonds once she returns from the World Championships in Richmond in the autumn? She explains all. When Simmonds is road racing, she is doing so under the watchful eye of commissaires, those oft-forgot about integral folk of cycle racing. We spent a morning in a commissaire car recently, finding out all about their secret life which lasts from 9.30am to 5pm; a full day’s volunteering all for the love of the sport. Elsewhere in this week’s magazine, there’s an obituary to Roger Dunne, the 1980s British international star who sadly passed away earlier this month at his home in southern France. Matt Bottrill, the outgoing time-trial king, talks us through his Giant Trinity TT bike that he will riding on at this weekend’s National 10, while Steve Lampier explains in his guest column his pride of winning the Elite Road Series. Ever suffered back pain through cycling? We tell you how to avoid injury and maintain a good posture. And if age is an excuse for not riding, then read all about three veterans whose cycling careers have gone on an upward spiral since hitting pension age. Also receiving inspection the Swift Carbon Ultravox Ti. But what is it like to ride? Dunkery Beacon is this week’s killer hill – can you conquer its punishing gradient? Cycling Weekly is available in supermarkets and all good newsagents, priced at just £2.99. On sale until Wednesday, August 26. Also available on digital download across all devices.